Pepperland was part of the score written in 1968 by George Martin for the Yellow Submarine animated film. The soundtrack's instrumental pieces were performed by the 41-piece George Martin Orchestra at Abbey Road on 22 and 23 October 1968. Martin conducted the players himself, with John Burgess and Ron Richards co-producing. Pepperland is the nearest Martin's score gets to a theme tune for the film, with a strong melody repeated a number of times. 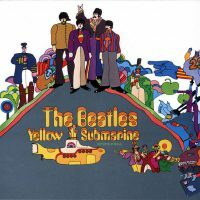 The tune contains, uniquely among the Yellow Submarine compositions, a brief piano interlude. It is also notable for the absence of novelty sounds and musical experimentation, which Martin wove into his other pieces to compliment the visual effects in the film. Pepperland was the opening track on the second side of the Yellow Submarine soundtrack LP, which was released in January 1969. Random question: A lot of people seem to include this and the other Yellow Submarine works amongst the Beatles official compositions. Since it doesn’t look like group had anything to do with composing these songs, are these considered official Beatles songs? Well they’re official in that they’re on a Beatles album. But in reality, no, they’re just written about here for the sake of completion – I don’t consider them Beatles songs any more than Ken Thorne’s incidental music for Help!, which was released on that US album. I think that the score provided by George Martin provides a significant insight into his contribution to The Beatles. It’s a pretty good piece of work and I wonder if he put a lot into this as an opportunity to showcase his talent on a Beatles record and if the Beatles ever commented positively about it or if it was just regarded as filler for the movie soundtrack. Either way, thank you for including the notes on this work. Where I can buy or to obtain the full score of Pepperland? Hi celso, I need to get the full score too. Did you get it? If yes, how?